Looks good and works fine. Matches other polished brass fixtures. 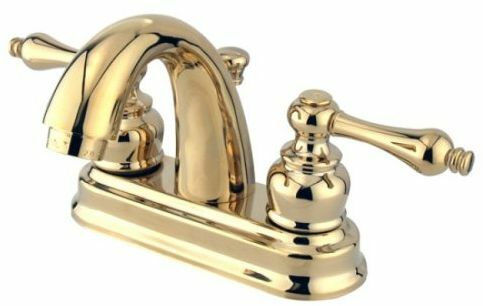 The master bath in my house has all brass fixtures, so I had to find a faucet to match as a replacement for a single handle model that broke and no replacement parts available (unknown brand). The choices at the home improvement or big box stores were not as extensive as Amazon and were more expensive. I do not like single knob faucets so I was glad to find this dual handle model from Kingston. It is metal, not plastic and so far works fine and is easy to wipe clean. Installation was similar to any other faucet of this kind. The aerator does restricts water flow, but that saves water and prevents splashing. The hot and cold knobs do not tighten very firmly, so every once in a while I have to make sure they are coming loose...guess I could put some thread locker in there, ha ha. I once read that manufacturers take the least productive person off of their assembly line to write installation instructions. That seems to be the case here. Parts shown on the parts diagrams were in the wrong place. Parts referred to in the instructions didn't exist. The faucet is beautiful and works well. Edit 1/15/2019 - The cartridges have developed a very gritty feel. I've written to the company for a fix. Took off another star for the problem. This is a quality product. Only one warning. The drain is for a sink that has overflow protection. If your sink does not have provision for overflow, the parts will not work. However, I re-engineered ours to work. It took several beers and some home made parts, but it finally submitted with no leaks. Nice, heavy, solid fixture. Surprised and impressed by the quality at this price point! I would've expected to pay twice this amount in a store for a fixture of this quality. Installation was basic as far as faucet installation goes - no surprises. Very pleased! Terrible instructions, good looking faucet. The instructions for installing the drain assembly were clearly not the right instructions for this product, and this caused a lot of unnecessary frustration. You're better off just looking at the parts and figuring it out yourself.